Hey, does the idea of another company making another proprietary game controller for games that require compatibility with said controller in order to work excite you? No? Me neither. But GreenThrottle, a new startup co-founded by Guitar Hero co-creator Charles Huang and two ex-Palm employees wants you to get excited. Oh man, they're having so much fun - how could this idea ever not be a success? 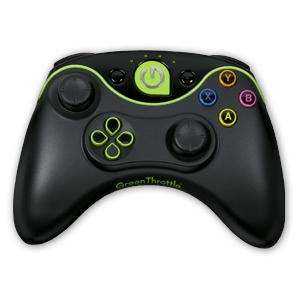 Sarcasm aside, GreenThrottle does have the benefit of a more serious team leading its gamepad project, but compared to every other controller / TV gaming solution I've seen, this seems to bring nothing new to the table. GreenThrottle's ace in the hole, though, is that it's promising to develop first-party games and a TV-optimized app ("Arena") for its platform to get the ball rolling... sort of like Ouya. It's currently offering developers a hardware SDK pack (starting at $44.95 for one gamepad) to make games compatible with the Atlas controller before the product launches. For the time being, only Unity engine games will work with the GreenThrottle SDK, but the team plans to add support for more languages over time. The controller, which is basically an Xbox gamepad clone, communicates with your Android device via Bluetooth. Being a TV-oriented gaming solution, the GreenThrottle platform is only compatible with phones that support HDMI-out via MHL or microHDMI connectivity, yet another barrier to entry. But really, the biggest problem with this project (and Ouya) isn't technical. It's that even if those few first-party games emerge, and even if they're actually any good (a much bigger "if"), you're almost certainly asking someone to spend more money on the hardware up front than will be worth it with the launch selection of titles. This is why the home console market is a three-horse race: the money needed for a successful launch is massive. If you can't get the good titles lined up quickly after release, no one's going to want to buy into your platform, even if your platform is just a controller and an app (with the requirement of an HDMI / MHL cable and compatible device). We've seen numerous companies pitch their ideas for a smartphone or tablet-powered TV gaming solution, on the premise of "consolidation" of the technology in our pockets. It must be alluring for enterprising individuals, the smartphone and the TV, two things most people already have, negating the costly requirement of developing a console - all you need is a controller and a storefront. We have never seen one of these systems succeed commercially or, frankly, come close to it. And lackluster developer support is almost always the smoking gun. Is there hope that GreenThrottle may be the disruptive force that changes the smartphone-to-TV gaming landscape into a real industry? At this point, I'm not holding my breath.